Health care in Spain | PERELLÓ PROPERTIES DIRECT S.L. The Spanish healthcare system is funded by social security contributions and combines public and private healthcare.The government sets the overall budget for the country, but each region takes individual responsibility. To benefit from the Spanish National Healthcare system and medical assistance, residents must enrol with the General Social Security Fund (Dirección General de la Tesorería General de la Seguridad Social – TGSS). This gives access have access to free or low cost healthcare. Provincial social security offices are located throughout the country. Contributory: The contributory scheme consists of one general and five special schemes, which includes the majority of the working population. Students are covered by a special protection plan. Non-contributory: The non-contributory level is for people with no or with a very low income. The benefits include medical assistance. Any resident, either salaried or self-employed, is issued with a social security number. This entitles a person to healthcare, sickness, unemployment benefits, as well as government pensions. Once a number is obtained, it is valid for life. Employers request a social security number for an employee if they don’t already have one. Self-employed workers may make the application themselves or hire a gestor to complete the process for them. The application form and required documentation should be presented to a local office (local to the applicant’s workplace or home) of the TGSS. Once the application has been submitted, the worker receives a certificate of registration (documento de afiliación) and a registration number. If a person loses their job or ceases to work, they must notify the Tesorería General de la Seguridad Social immediately. The worker is liable for contributions until the agency is notified. CatSalut, the Catalan Health Service, is the public body that guarantees the right of health care protection for all citizens in Catalonia. Visit their website to find out about health care in Barcelona and Catalonia. Health care is available at the primary health care centres “Centres d’atenció primària” (CAP) Find your CAP centre here Call telephone number 061 for medical emergencies from anywhere in Catalonia. The telephone number 902111444 is an official helpline that can answer any questions you have on general health, illness or health services for residents of Catalonia. 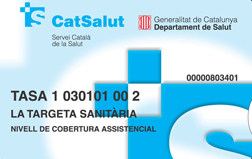 If you are a permanent resident then you can apply for your personal Catalan health card called “Tarjeta Santaria Individual” or “TSI” for free health services in Catalunya. Catalonia has been managing its own health system since 1990 and it has become a quality of reference all over Europe. There are 400 centres of primary health care and 68 hospitals for public use, irrespective of its ownership. It is therefore a mixed health model that integrates all available resources into one network. Coming from a long medical and health tradition, the Catalan professionals are well-known for their innovative treatments, research and management, in such a way that hospitals like Vall d’Hebron, Sant Pau, l’Hospital Clínic and provincial de Barcelona and l’Hospital Germans Trias i Pujol, among others, are valued on an international level. The high specialisation of these centres attracts hundreds of people from all over the world who wish to be treated in Catalonia. Oncological and cardiological care are very highly considered by international teams and both have an official action protocol that has managed to reduce the mortality rate for these types of illnesses. In addition, the large number of primary care centres guarantees proper basic care for the whole population. About 25 percent of people living in Spain have private health insurance. Advantages to private insurance include immediate access to specialists, more choice in which specialist you choose and much lower waiting times for operations. This entry was posted in Links by bobherbert. Bookmark the permalink.